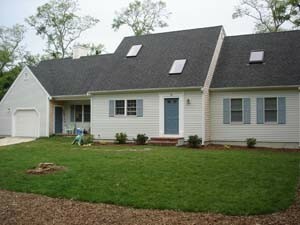 We are offering for rent our brand new custom home in beautiful Cape Cod between the weeks of April 1st 2008 through December 31st 2008. This home is over 2500 Square feet and has four bedroom and 2 Â½ baths. It will sleep eight people comfortably. Hardwood floors through out and berber carpet in all of the bedrooms. Tastefully furnished with a large kitchen table and screened in porch including exterior deck with outdoor shower. Granite slabs in the kitchen with all new appliances. There is cable TV in three locations including master bedroom. Wireless Internet hub located on site. Main Floor master for easy access for seniors or wheelchair. 2.5 baths, central air, dish washer, washer and dryer, linens provided, brand new fully stocked kitchen, cable, wireless internet, outdoor shower, outdoor gas grill, deck, screened in porch. 5 minute walk to the bay and multiple beautiful beaches. 10 minute walk to a nearby lake. Minutes from the National Seashore, Coast Guard beach and Nauset beach - great bike ride or quick drive. Downtown features many great restaurants, mini golf/arcades for kids, as well as the Capeâ€™s last drive in movie theater. Weekly rental based on a Saturday to Saturday stay. Check in time is 5:00 p.m. Check out time is 12:00 pm. Renter will supply all linens and towels. Available from April 1 2008 - December 31 - 2008.